Every cloud has a golden lining in the vast Yukon sky! 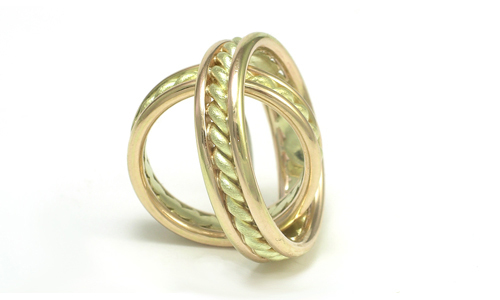 Capture the feeling in these richly woven bands of natural placer gold found on site in small scale mines in the lively hills of the far north west. Natural placer Yukon gold framed with 14 karat Recycled gold. What a pair! Warm hammer textures and natural Yukon Placer gold. 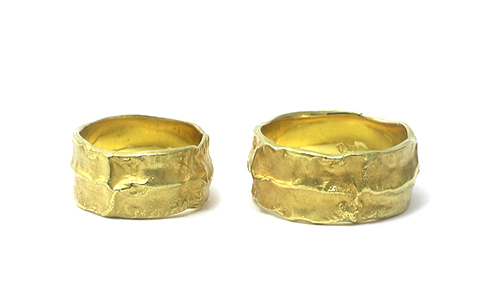 This combination casts golden flares of light over masterpieces of hand-made wedding bands.Natural Yukon placer gold, framed in our recycled 14 karat yellow gold. Once in a blue moon someone like you comes along. Each of us might not be more than a drop in the ocean, but two drops can change it’s composition. Martinus’ double wave for the two of you. 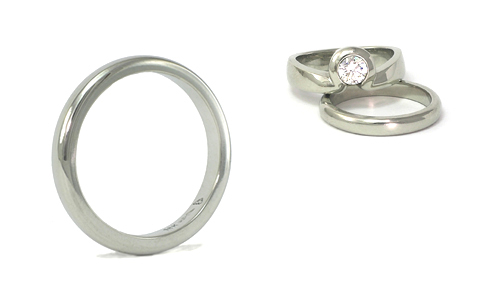 18 karat white gold solid for a lifetime. Inspired by a nighttime wave, gently lifting you up and tenderly moving you along. 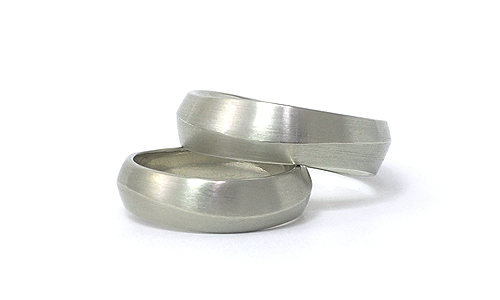 Satin, brushed textures flow with tender lines, complementing the ring's polished interiors. Shapes and surfaces come together like joy and sincerity. In 18 karat white gold. 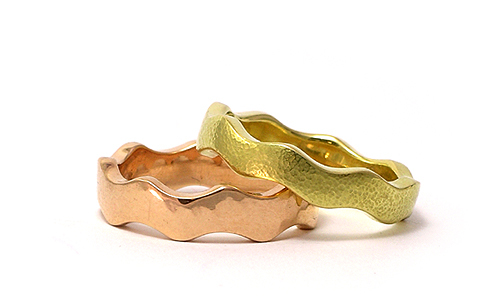 Like refreshing summer waves, gentle contours of gold flow around your finger. Glistening warm matte tones on the outside highly polished inside. Delightful elegance. Available in yellow, rose, or white 18 karat gold. Sweet, spicy and classy! 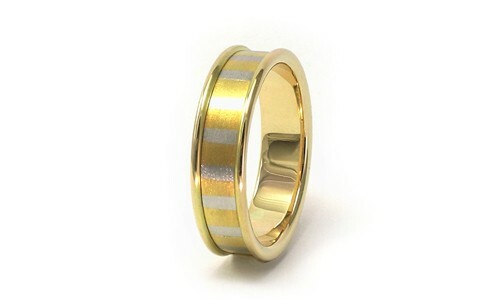 Rose gold and white gold accent this special inlay design. 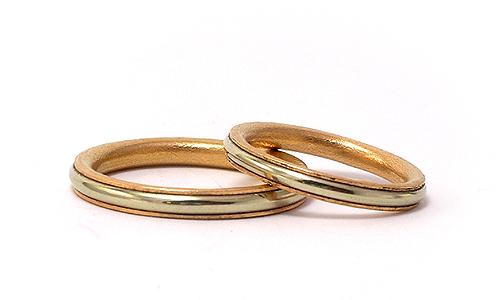 A pristine, white gold band is embedded within a continuous curve of warm rose gold. Everlasting precision in 18 karat. 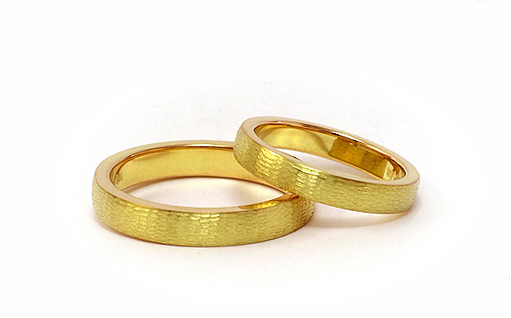 Divine simplicity and gentle bonds of love are shared with these impressive, textured bands. A subtle flow of contours is balanced with comfortably rounded, highly polished interiors. Remarkable, weighty, glowing in 18 karat gold. Classical. 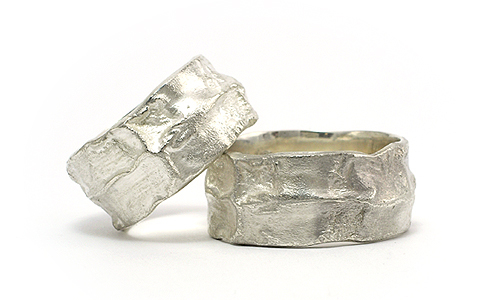 Natural silver leaflets are redefined as Martinus honours true commitments and life’s deeper meanings. 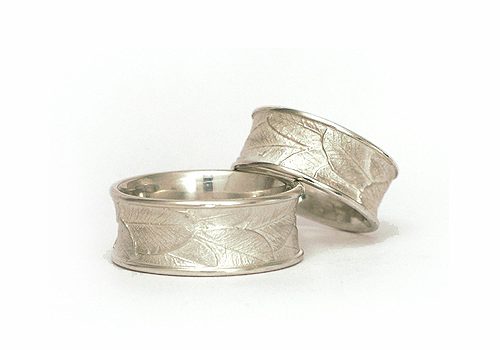 Polished side bands compliment a highly detailed, surface leaf pattern. Elite Silver, tarnish-free. Also available in 18 karat white gold: $1,080/$1,280. Seeds for the future, a stunning design, elegantly crafted with sensitivity and vision. 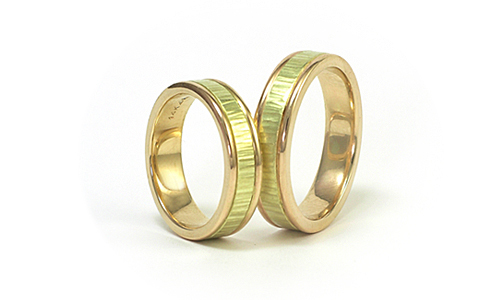 These new style Martinus bands present fine seed grain patterns in matted yellow gold and smooth interior. 18 karat Yellow Gold. Eternal and reminiscent of hues of golden days and gentle nights. 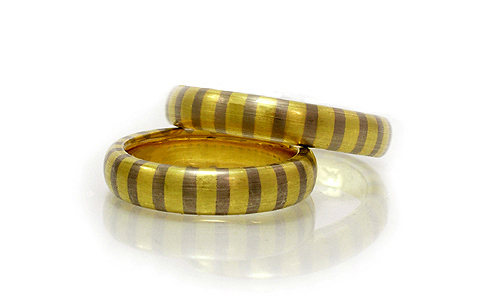 This ring merges golden intensity with the fine gray of palladium, similar to the masks of Egyptian Pharaohs. 18 karat gold and palladium. Sophisticated. Golden, delicate leaflets are redefined, as Martinus honors truth and life’s deeper meanings. 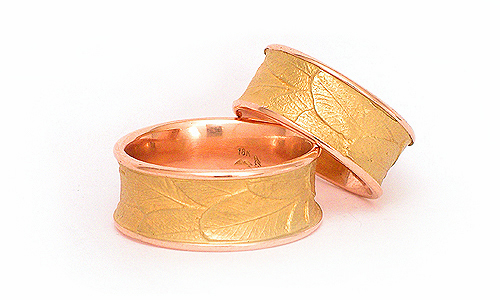 Polished rose gold side bands compliment a highly detailed, golden surface pattern. 18 karat rose gold colour enhanced. 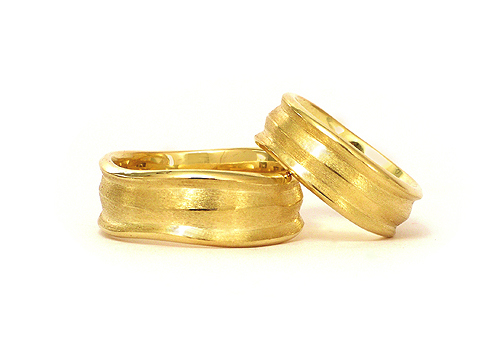 Also available in 18 karat yellow gold. Expressions of joy on a sunny day at the beach. Warm, textured surfaces and highly polished lines combine in a gentle double wave. 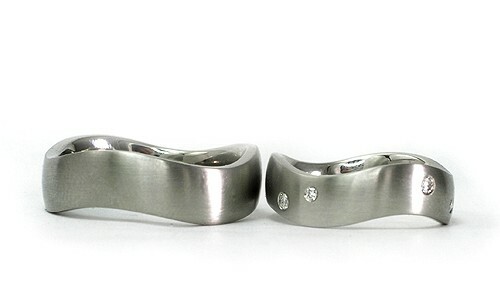 A solid pair where all shapes are caringly crafted to suit your hands for life. 18 karat yellow gold. Sand is hot, summer is here. Touching hands and a jump and a splash takes you into the sea. The bright, warmly textured surfaces, as well as the elegant lines in this meaningful wedding pair speak of joy and belonging. 18 karat yellow gold, solid for life. Reticulation is the name of this naturally textured, flame created surface of hills and valleys. Flowing like molten lava, undulating in its surface like Vesuvius Volcano itself. 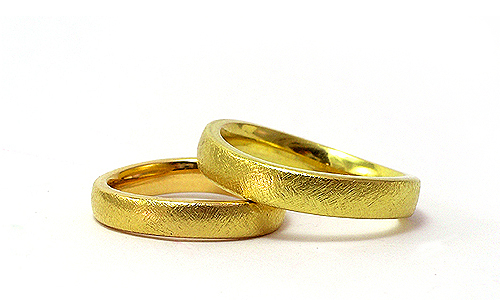 Lava is made in 18 karat yellow gold. The Greek spirit of sincerity is our guardian of style and elegance. 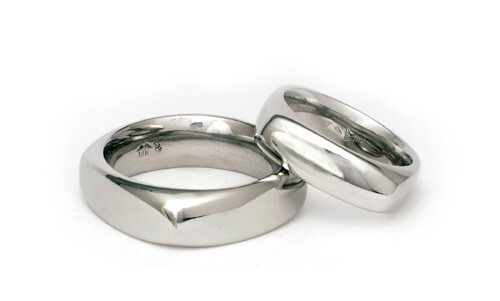 Echo the bond of truth and courage in simplicity with this wedding rings’ fine polished design. 18 karat white gold. Pair it for brilliance with our Theia diamond ring. Eternal and reminiscent of hues of golden days and gentle nights. 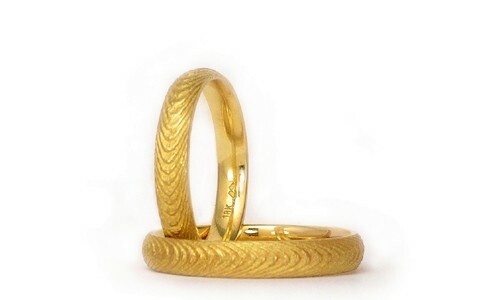 This ring merges golden intensity with the fine gray of palladium similar to the masks of Egyptian Pharaohs. 18 karat gold and platinum. Etched with the strength of winter surf, committed like a warm summer sun coming again and again. Martinus’ eternal treasure bands come inspired with a faith wish. An ancient cuttlefish bone technique was used to cast patterns of no beginning and no end. 18 karat yellow gold. Expose yourself to the dance of life, Share wedding bands of passion and style and cherish every turn on the tips of your toes. Enjoy life's treasures to the fullest! White gold 18 karat Diamonds. True love has beautiful facets. Merge your lives; honour your families, feel good to share. Consider what our grandparents could never dream of. 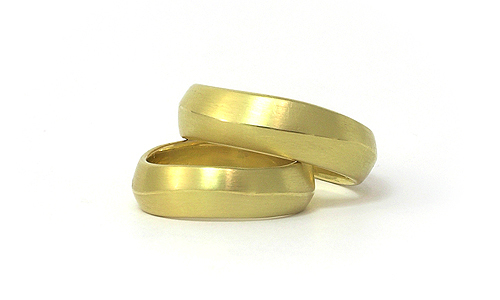 You have endless possibilities with Martinus handmade wedding rings. We create with environmental consciousness. Here the gold is melted and recycled if you wish. Come and decide together. Put your heart into a ring style that the most wonderful person beside you is going to cherish for a life time? 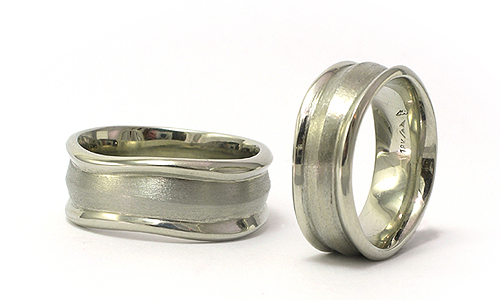 We work in three gold colours, platinum and silver. Making your bands to size may take three to five weeks. Put your hands on eternity. See the new designs. We are happy you like one of our designs! What would you like to know? We accept VISA, MasterCard, PayPal or e-transfer. We also accept Canadian cheques, American checks, and of course, cash.